Here at The Black Gnats, our love of fly fishing extends to more than just being on the water and catching fish … it also includes geeking out over all kinds of gear for anglers. Between the three of us we’ve acquired quite an eclectic collection of stuff. In this new section we’ll share some of our favorite finds – from rods, reels and lines to packs, waders and all kinds of fly fishing accessories in between. Unlike other sites, our “reviews” won’t always be long, overly detailed, or in-depth, but we promise that we personally own and/or have used everything mentioned. Garrick and Andy seem to have a healthy relationship with gear, only researching and buying new items as they need. I on the other hand, and the search history on my work laptop will support this, have a bit of a gear addiction. I enjoy nothing more than a new piece of kit and buy them far too frequently. I’ve been using these Saboten Fine Tipped Garden Scissors for the past three weeks. While they’re not fine enough for flies sized #22 and up, it gets the job done for most all other applications. I won’t bore any of you with technical specs, but the’re sharp, sturdy, and ergonomic. 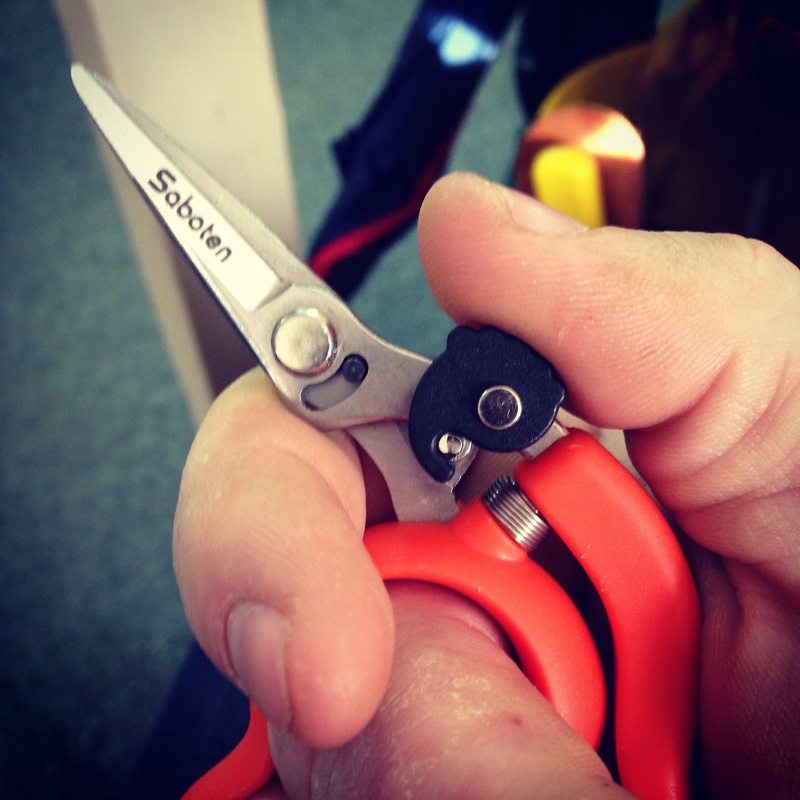 For me, they vastly improved my ability to hold the scissors in my hand while working. The integrated thumb lock makes it easy to whip them into action when they are needed and get them out of the way when you don’t. You can pick them up online for just under $19 at Hida Tool and Hardware Co.
How about you? Have a favorite pair of scissors or gear when tying? Hit us up in the comments below and let us know what you think.